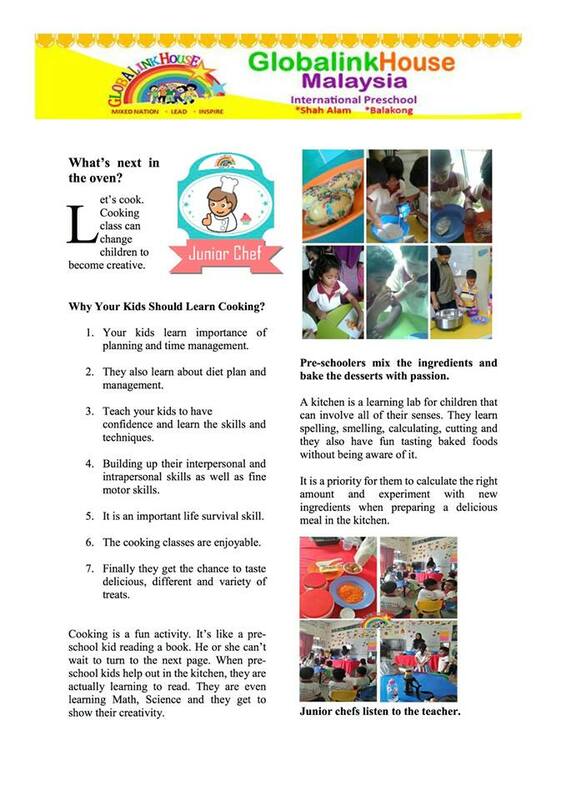 7 Reasons why GlobalinkHouse International Preschool, Shah Alam incorporate Cooking in its Curriculum! 1. Math Skills: Doubling a recipe requires addition (or multiplication) skills, halving it requires division, and recipe fractions like 1/2 cup and 3/4 teaspoon bring math applications into the kitchen. Often, kids don't recognize they are practicing math! 2. Comprehension: Reading and understanding step-by-step directions, adding ingredients in sequence, and techniques such as folding and blending, are all important components to yielding the finished food product. Helping your child fine tune his reading comprehension skills at the same time doesn't hurt! 3. Real Life Science: Cooking is a science experiment. Too much salt, baking powder, not enough flour, or the wrong timing and you're likely to have a flop on your hands. Cooking provides an opportunity for kids to get hands-on experience with basic science. 4. 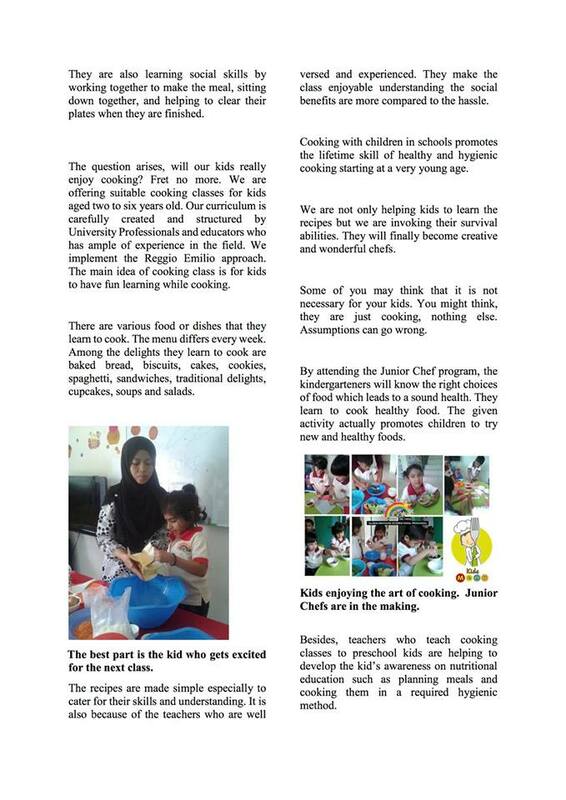 Self-Esteem: Cooking allows kids to get instant feedback, which helps them learn and grow in self-knowledge. Learning a new skill, such as baking or cooking, is known to help grade school children with healthy self-esteem development. 5. Communication: A relaxed atmosphere in the kitchen offers an opportunity to talk, about anything! Parents can take advantage of this, especially with teens, as communication is a key element to raising a well-adjusted, healthy child. 6. Life Skills: Cooking is a life skill, much like driving a car, learning to read, or swimming. As children grow and get closer to adulthood, the job of feeding becomes theirs. 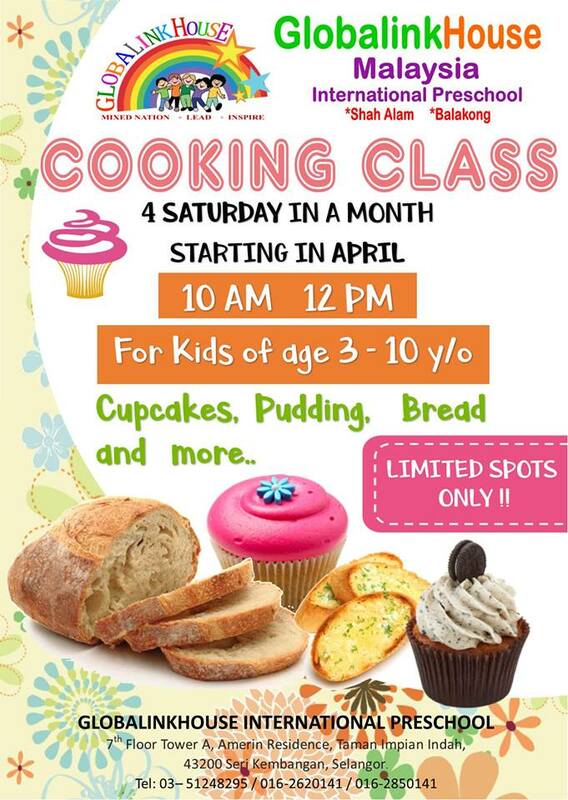 Start the cooking lessons at a young age so the transition to adult cook is easy later on. 7. Fun! 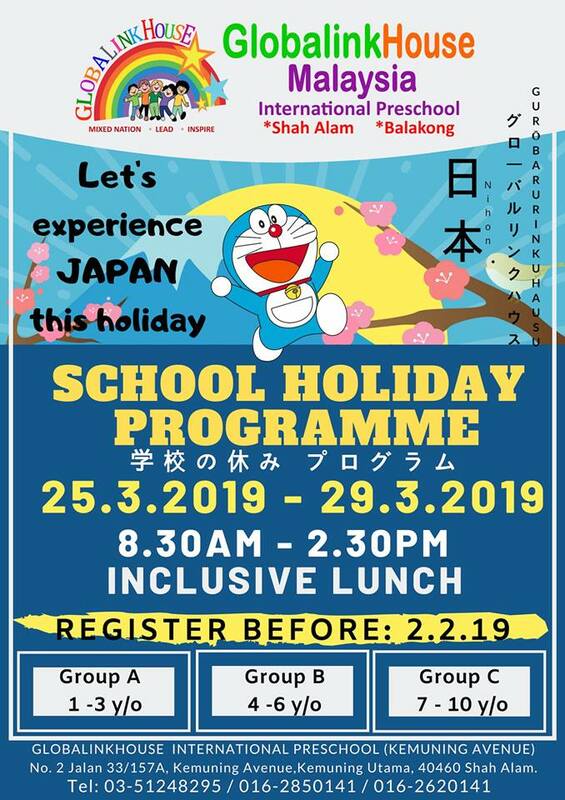 Last but not least, cooking is fun! Having fun with your child in the kitchen builds positive memories, good vibes, and good food.With all the benefits of teaching kids to cook, and no limits with starting. 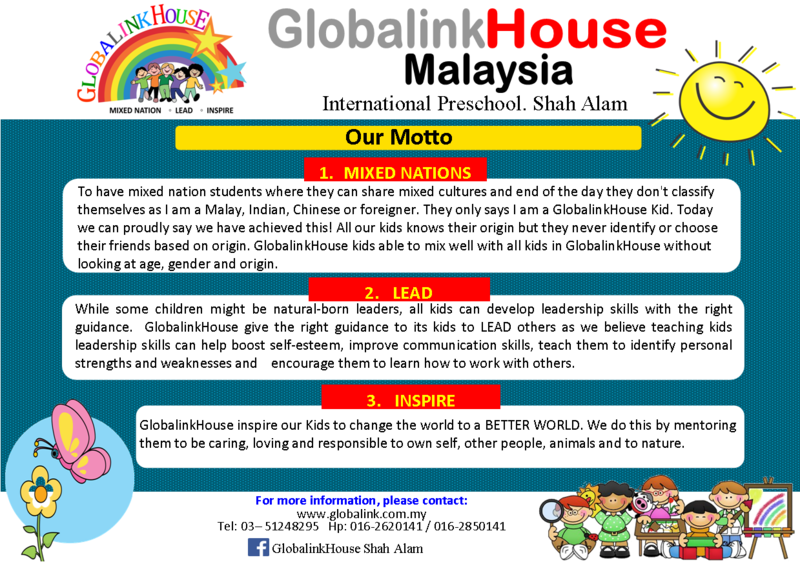 GlobalinkHouse International Preschool, Shah Alam has supported in the development of a child who is all rounded! 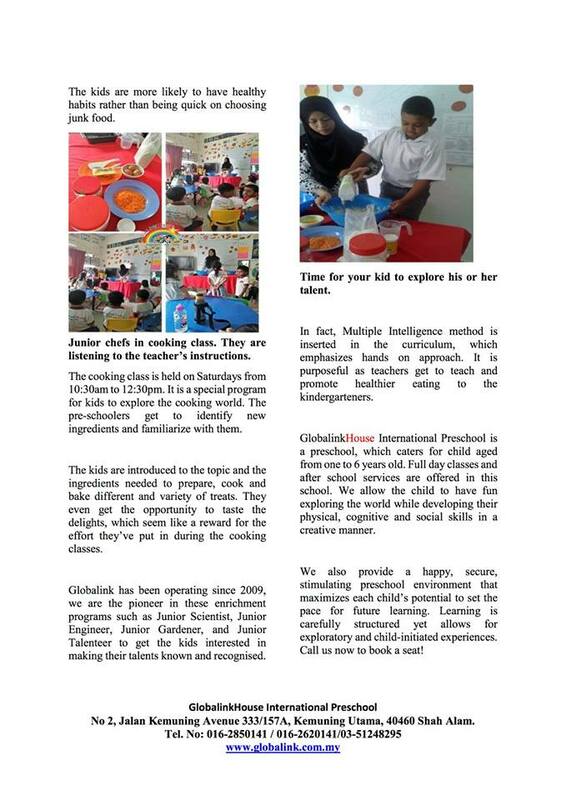 Globalink creates Geniuses!